This week I finally got around to seeing Jerusalem, Jez Butterworth’s acclaimed ‘state of the nation’ play now transferred to the West End. All the praise lavished on Mark Rylance for his portrayal of Johnny ‘Rooster’ Byron, the ‘hero’ of the drama is thoroughly deserved. 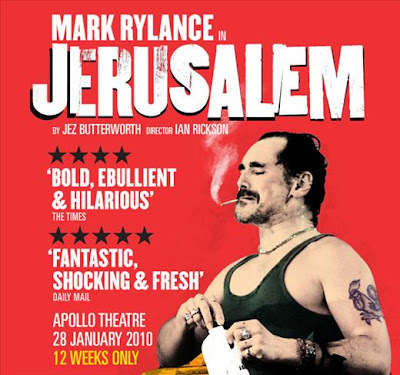 Barely off stage in three hours, Rylance is astonishing. But the play itself, though marked by brilliance, is problematic. Byron is a former motorbike stuntman who inhabits a dilapidated caravan parked within a Wiltshire wood and opposite a new-build estate full of respectable folk who loathe his proximate presence. At the beginning of the play he is served with an eviction notice by Kennett and Avon council. He hasn’t worked in years, though we later learn that regular donations of his rare ‘gypsy’ blood group earn him £1000 a month from the NHS. He offers copious amounts of booze and drugs and music and fantasy (the currency of modern England) to the local kids, like a deranged Pied Piper. He also attracts the attention of an elderly academic (a fine performance from Alan David) who, distanced by class and status from Byron’s retinue, indulges them and their neo-paganism. The action takes place, significantly, on St George’s day, as the local Flintock village carnival is about to get under way. One of the children attracted to Byron is 15-year-old Phaedra, who opens the play with a moving account of the Blake poem which gives the play its name. The current carnival queen, she is dressed in homage to Shakespeare’s Titania (Byron being Falstaff?). But she goes missing and it is when her father Troy seeks answers from Byron, that the latter is revealed as something more than a lovable rogue: menacing, predatory, weirdly unsympathetic to a distraught father. Darker secrets are revealed after Troy, symbol of conventional society, takes revenge. A bloodied Byron calls on his odd panoply of pagan gods in a closing, rather silly Gottedammerung. for oaths: martyrologist: the friend of Charlemagne.